What are the best real ways to make money from home? Can you really earn more money from home for free? Are you looking to supplement your 9-5 by making money at home? Ready for more extra money than just your paycheck? You can actually make money from home by doing a variety of jobs and projects that can help bring in a little extra every month. 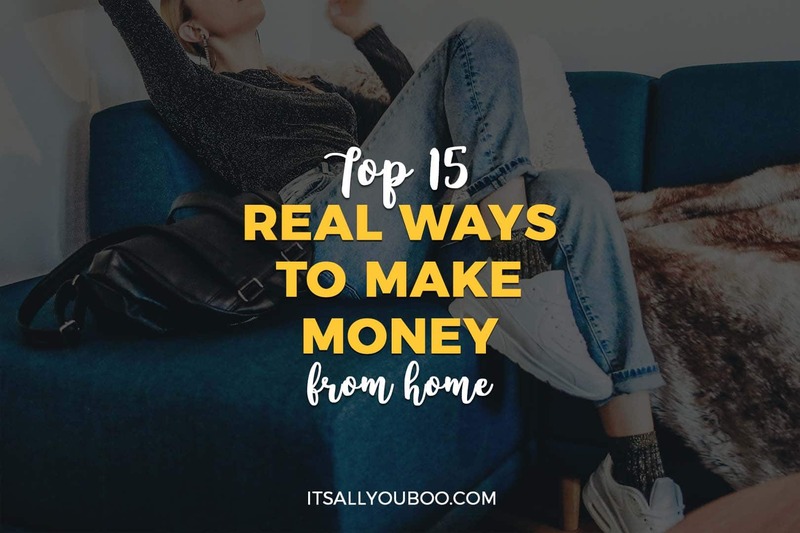 So many of us love the idea of being able to make money from home! Sometimes you just need to pick up ways to bring in extra cash to make ends meet or to save up for a rainy day. You might be wondering if you really can make money from home and you’d be surprised to find out that there are so many real opportunities out there that are totally legit. Are you a master crafter? Are you bursting with creativity? Do you have a passion project? If you’ve got the talent and skills to create amazing handmade goods from scratch, then you just might try your luck at becoming a crafter and selling your products on Etsy! There are so many things you can make by hand and sell online or a craft shows in your local neighborhood. From paintings to jewelry, candles, soaps, painted pots, one-of-a-kind home decor — you name it. If you know how to make something unique and would make a great gift, then go for it. Think about what skills you have and what things you might make now that you do for fun. Sometimes your own hobbies have the best potential to turn into real ways to make money from home. 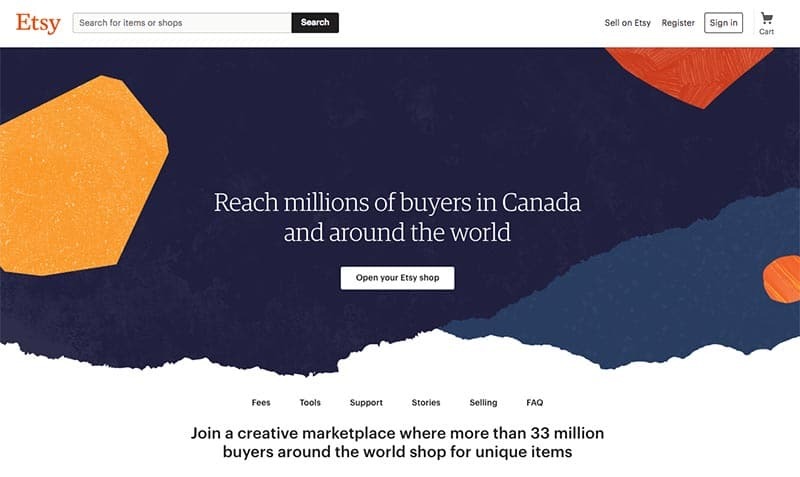 Start making money from home by starting an Etsy shop. Do you love taking photos for fun? Photography is a super underrated way to make money on the side. It’s great because you don’t really need fancy equipment to get the job done and you can set your own hours. You can do family portraits and headshots for your friends and family and whoever else they refer to you. You can easily learn tips and tricks to improve your photography by watching videos on YouTube and practicing. And if you like taking other types of photos like of nature, people, products, etc. you might want to consider selling stock photography online! There are several websites out there such as iStock, Shutterstock, and Flickr where you can share your photography and get paid every time someone wants to purchase the license to use your work. Make money at home selling stock photography or as a portrait photographer. You might be shocked to hear that you can actually get paid to simply just give your opinion. There are so many ways to go about this. Check in your city if there is a market research panel looking for people to give their opinions. More often than not, you’ll find that there are places where you can either go in person or go online and give your thoughts on a product or service that is currently being researched and tested. You can easily make anywhere between $20-$200 depending on the study! Another way to get paid to give your opinion is by doing online surveys. Simply by clicking a few buttons and answering your thoughts on the questions in the survey, you can earn money. It’s so easy to do and you can even do it from your phone while watching TV or doing laundry. You can either get paid in cash or rewards like gift cards… and the rewards do add up! Some great survey sites to check out are SwagBucks, MyPoints, and Survey Junkie. You can build a successful side hustle in direct marketing and sales! It’s quick and very cost effective to get started. If you’re wondering what exactly direct marketing is, no worries. According to Avon, it’s a type of selling where products are marketed directly to customers. This eliminates the need for wholesalers, advertisers, and retailers who are often the middlemen in selling. With a direct marketing and sales side gig, you can work straight from home, set your own hours, and make as little or as much side money as you want. There are so many different products you can sell in direct marketing such as makeup, home products, health, and weight loss, etc. Some great companies to check out are MaryKay, Avon, Arbonne, Scentsy, and Seacret. Ever wanted to open up your very own shop but just didn’t have upfront cash for the inventory? Look no further, there’s something called dropshipping that may be the answer as one of the top real ways to make money from home. This means that when a store sells a product, it purchases the item from a third party and once purchased, the store has it shipped directly to the customer. Basically, you never see or handle the product yourself! You have someone else take care of the storage of your inventory and the shipping to the customer. A wholesaler or manufacturer fulfills all your orders for you and you only need to purchase as much inventory as people order from your website. Pretty cool, huh? Start your dropshipping business and make money from home. Do you like talking on the phone? Have a computer? Nowadays, so many companies are offering remote work-from-home part-time and seasonal jobs for their call centers. Easily search and find the best remote job for you on Flexjobs. .Companies like U-Haul, HSN, 1-800-Flowers, and many more are coming out with more and more well-paying remote positions that are seriously real ways to make money from home because they offer benefits, flexible scheduling, and you don’t even need to leave your house. Usually, all you really need is a computer and great internet connection. Many companies may either provide the other equipment needed or ask that you have your own phone. Becoming a virtual assistant is always a really great way to make money from home. You may have heard the term virtual assistant or VA before. A virtual assistant is an online personal assistant who helps people and businesses with day to day tasks and projects. There are many business owners out there who may not have all the time to get certain things done in their business. As a virtual assistant, you can earn anywhere between $12-$30 an hour. The most experienced virtual assistants can even charge $50 an hour for their work! If you have computer skills and some knowledge of the tasks listed above, then you can definitely choose to become a virtual assistant as one of the real ways to make money from home. If you love children, this might be the perfect way for you to make extra money on the side! Babysitting isn’t the most glamorous side hustle out there, but it can be pretty profitable. Babysitting can pay anywhere between $12-$18 an hour. Plus, there will always be a need for babysitting services as long as people continue to have children. You won’t need to worry about work drying up or ending up with a lack of paying customers. Reach out to people in your community or friends and family and see if their need any childcare services. Another great way to find customers is to take your search to the web. 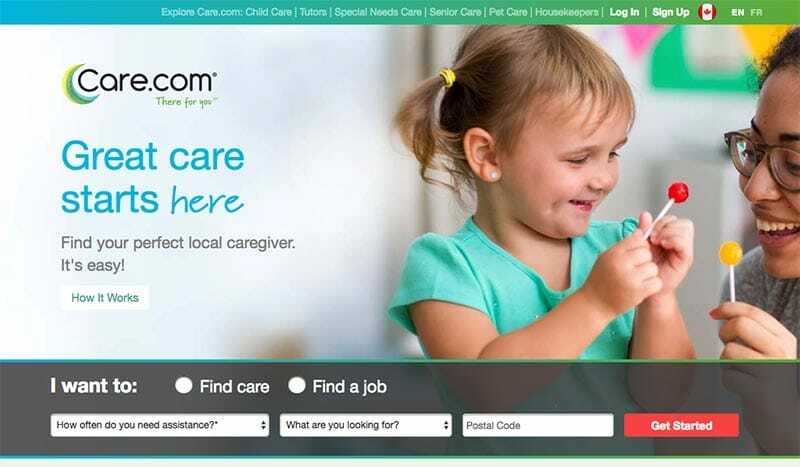 Join Care.com and list your services on their websites to find people in your area. If you have a knack for making great home-cooked meals, then you just might want to try meal prep as a fun and creative way to make money from home. If you know anyone in your neighborhood that might be tight on time and unable to cook meals every day of the week, consider reaching out to them to set up a meal prep service. A meal prep service is a great way to make extra cash on the side because most of the time, you were going to cook yourself dinner anyway, so why not make a double batch and sell the rest? With this side hustle, you can make anywhere between $50-$100 a week and even more depending on how many people want to purchase your meals. It’s one of the most unique and real ways to make money from home especially if love cooking for others. It makes it so much easier for the people buying your meals because it usually requires zero prep from them besides thawing it out and popping it into the oven. If you love writing, becoming a freelance writer is one of the real ways you can make money from home because all you need is your laptop! If you have the skills to passionately write about different topics, then you should consider freelance writing. Freelance writing means writing papers and articles for other people to publish on their websites. Put your love of words to use and get paid for it! Decide on your niche of writing and topics you are best at and the create an account on websites like Upwork to start pitching to potential clients. Freelance writing can pay anywhere from $25-$50 dollars an article and some clients even pay by word count. There are hundreds of websites that will pay you to write. This is one of the more outside-of-the-box real ways to make money from home! Did you know you could simply test out apps on your phone and get paid for it? You don’t even need to leave your bed to do it. There are a few websites to check out that can pay you to test out apps. Some of them include FeaturePoints, 99tests, AppCoiner, and TestBirds. As an app tester, all you need to do is download the app and play on it for a few minutes and then report feedback. You can then receive cash or rewards that you can redeem for gift cards following the testing of the app. The best part is how easy it is to do and you don’t even need to keep the apps on your phone! You can simply delete them afterward. If you’ve got an eye for design, you might consider “flipping” as your next way to make some extra money on the side. Flipping means turning something that might be raggedy, old, and outdated into something brand new and beautiful. If you can spot bargains on Craigslist, your local thrift shop or yard sales, you can find old furniture to flip. Take on the project and paint, sand, decorate, and change out the handles of the furniture piece and you can easily sell it for more than you paid for, especially if it’s a one-of-a-kind design! Flipping furniture and other items is one of the best real ways to make money from home because people are constantly looking to furnish their homes and get a good deal out of it too! Have a spare room in your home? Why not rent it out on Airbnb? This could be a great monthly income if you have some space you’re willing to rent out in your home. If you love meeting new people from all around the world, this definitely a fun way to make side cash! Plus, you won’t need to spend a dime on advertising your space because Airbnb will take care of that for you. You also won’t need to sell anything and you might even make a new friend. You can earn up to $50,000 a year depending on the area and how much space you have to rent out. It’s one of the most profitable real ways to make money from home! If you’re skilled at graphic design and love creating things, you may want to offer graphic design services on the side. This is an awesome way to make money on the side especially if you’re an introverted creative who doesn’t exactly want to start a gig that requires a ton of face time. If you have a laptop with the right programs to create logos and banners for websites, you can easily reach out to friends and local businesses who may be in need of sprucing up for their current branding. You can also promote your skills and make money on Fivvr, Upwrok, PeopleForHire, and other popular freelancing websites. Are you more on the techy side of things, web design is also a great way to make money from home. If you have a blog and know your way around WordPress or Squarespace this could be a great way to earn extra cash. If you know how to build and develop well-functioning websites, you can do freelance web design and list your services on websites like Upwork, iWebDev.com, and many more! You can earn anywhere between $45-$75 per hour or you can charge prices based on the project. Ready to manage all this extra money you’re making from the convenience of your home? 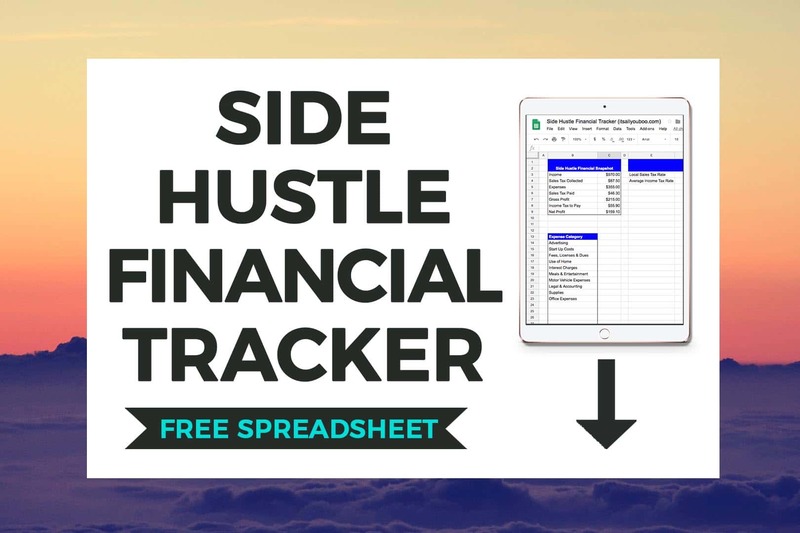 Get the Side Hustler Financial Tracker for your expenses and income. Don’t forget you’ll have to claim this extra money on your taxes, better start tracking it from day one. 9-5’s can’t always cover all the bills and sometimes we simply want to save up for a nice night out or a relaxing vacation. 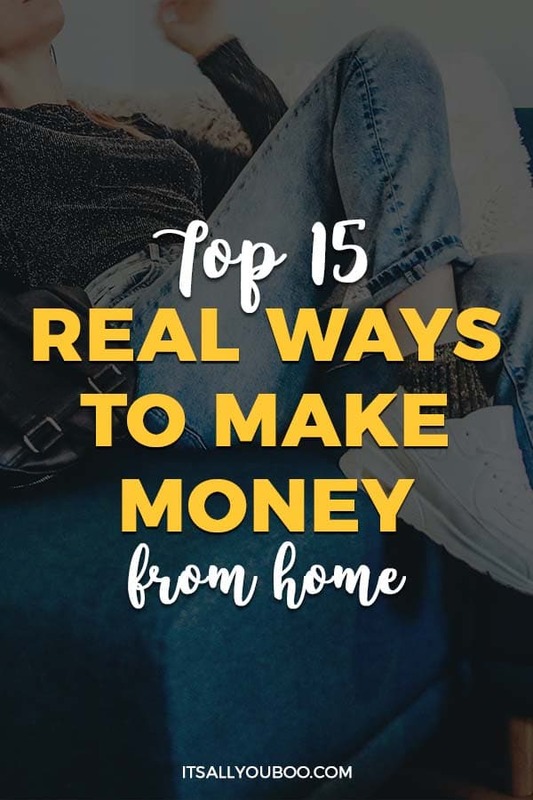 These top 15 real ways to make money from home are the perfect way to up your savings, help you find a fun new hobby, and meet new people. Hone in on your skills, let everyone you know know that about your side hustle, and stay confident in yourself. Then, you’ll be able to easily grow a successful and profitable business or side hustle that you’ve been dreaming of! What’s your favorite real way to make money from home? 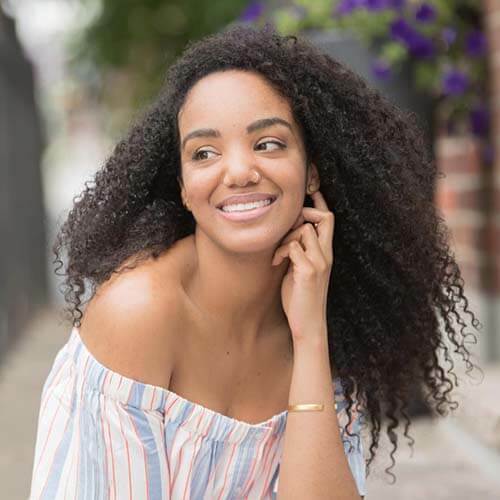 Amanda Montero is the creator of Simply Amanda, a lifestyle blog for millennial women interested in pursuing digital entrepreneurship and location independence. She is passionate about teaching women how to build a life you don’t need a vacation from. 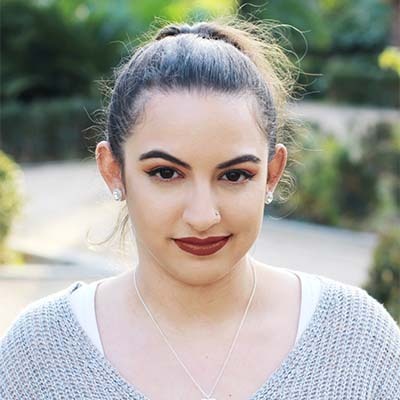 Amanda is also a Pinterest Manager, enjoys freelance writing in her spare time, and loves promoting financial freedom. What a fantastic list full of great options!! I love the idea of the getting paid to give opinions, I’ve never heard of that one before! I also really like the meal prep ideas, that is something that I can see myself offering in the future of my blog! Thanks! Yes! There are so many ways to start a side hustle that people might not even realize are options 🙂 Good luck starting yours! Oh my gosh this list is so diverse! And what I love is that you’ve designed your list so that anyone can do anyone of these, I feel I have so many options now! These are all great ways to make money on the side, from home! Thanks for this awesome list. Glad you found the list helpful, Leslie! This is a great list that you’ve compiled. My favorites are graphic designing and being a VA. You can easily do these from home whilst still in your nightgown and no one will ever know! Heh! Haha! For sure! You can do these at home, relaxing 🙂 My favorite is definitely graphic design! Those are really great idea but do they guarantee a good income. Apart from graphic design and web design which is a nice way of making money online when you have people to work for. Well i have to give some of those a try to see how real and helpful they well(can) be. Thanks for the tips. Glad you liked the post, Oyibo! That’s a great question — it all depends on how much time you have to work on your side hustle. My favorite side hustle that has definitely given me a good income with little time or experience is freelance writing! These are all great ideas. I had a drop ship store and it was easy. Marketing is the real work but everything else was painless. Amazon also has freelance delivery people. I have a family member who works in a hospital and in his spare time delivers packages. The extra money he makes is the best incentive. You’ve shared many good ideas. Love this idea, Elle! It’s definitely true that you can make a good income delivering packages on the side! This is a great list. There are a few things on this list that I would give a try. Thanks for sharing.